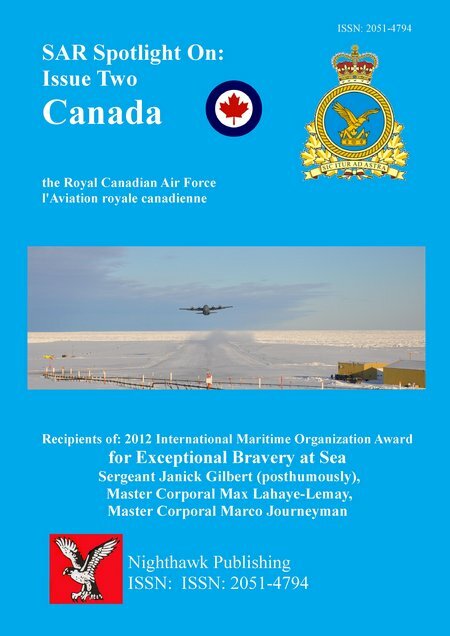 The second issue of this new serial publication led with the story of the IMO 2012 Exceptional Bravery At Sea Award, made to three RCAF SAR techs (one posthumous), the issue also reviewed the actions of the Cormorant helicopter crew who were not included in the IMO Award but received the Guild of Air Pilots and Air Navigators Guild Award for Gallantry. Canadian SAR service and the Canadian Coast Guard are reviewed, together with the NSR Mountain Rescue and the volunteer Canadian Lifeboat Institute. DESCRIPTION: The series is dedicated to Search And Rescue internationally, across the range of SAR services and including the treatment and rehabilitation of rescued casualties. The second issue of this new serial publication led with the story of the IMO 2012 Exceptional Bravery At Sea Award, made to three RCAF SAR techs (one posthumous), the issue also reviewed the actions of the Cormorant helicopter crew who were not included in the IMO Award but received the Guild of Air Pilots and Air Navigators Guild Award for Gallantry. Canadian SAR service and the Canadian Coast Guard are reviewed, together with the NSR Mountain Rescue and the volunteer Canadian Lifeboat Institute. The eMagazine achieved a high level of illustration with colour photographs and maps. Text included official citations and military action reports.